Canelo v Golovkin: Can GGG win a decision in Las Vegas? By Sean Jones: There’s a lot of talk going around that Gennady “GGG” Golovkin cannot beat Saul “Canelo” Alvarez by a decision in their fight on September 16 at the T-Mobile Arena in Las Vegas, Nevada. Golovkin (37-0, 33 KOs) must knock Canelo (49-1-1, 34 KOs) out for him to get the victory in this fight or else he’ll be robbed. GGG has NEVER fought in Las Vegas. He hasn’t brought money into the city like Canelo has during his career. Canelo has fought 7 times in Vegas. He’s brought money to the city, and he obviously will continue in the future to fight in Vegas. Golovkin has been fighting in New York, California and in Europe. There’s a definite imbalance between Canelo and Golovkin when it comes to Las Vegas. Golovkin’s promoter Tom Loeffler should have rejected the idea of him fighting Canelo in Vegas. You never want to put your fighter at a huge disadvantage when it comes to having them fight an opponent in a city that thrives whenever they fight there. You can argue that it’s REALLY bad for Vegas if Golovkin beats Canelo, as it could mean viewer boxing fans will stream into the city and spend their money in the future when the red-headed star fights over there. It probably doesn’t mean a whole lot to the city of Vegas if Golovkin loses, because he has NEVER fought there during his 11-year pro career, and he may not ever fight there again, especially if he gets robbed of a decision. It’s not hard to predict that Golovkin’s management won’t want any part of fighting Canelo a second time in Las Vegas if they wind up losing a controversial decision. Of course, if Canelo’s promoters at Golden Boy give Golovkin no choice but to have to fight in Las Vegas for the rematch, I imagine he’ll readily agree to fighting over there a second time if that’s the only way he can get a second fight. I can’t see Canelo giving in and agreeing to fight Golovkin in a neutral venue if he beats him by a controversial decision. Canelo never gave rematches to the guys he beat controversial decisions in Erislandy Lara and Austin Trout. Canelo moves on, and he doesn’t seem to care that tons of boxing fans thought he lost those 2 fights. The only thing Canelo cares about is the judges gave him the win. That’s why Golovkin will be in a tough position if he loses to Canelo by a controversial decision in Vegas. It won’t be any skin off Canelo’s back if he never faces Golovkin again. Canelo go turn around and go and fight WBO middleweight champion Billy Joe Saunders, Miguel Cotto and David Lemieux. Those 3 guys are predictable opponents for Canelo in his next 3 fights after he gets done with Golovkin. The three guys that Canelo likely won’t ever be matched against is Daniel Jacobs, Jermall Charlo and Sergiy Derevyanchenko. I don’t see those guys getting a fight against Canelo during their careers. If all Canelo has to do is survive the full 12 rounds for him to be given a decision win, it no matter how badly he fights, it puts a lot of pressure on Golovkin to score a knockout or else he goes down to defeat. Ideally, the judges will do a great job by being fair and scoring the fight properly without bias so that there isn’t any controversy with the results. However, future events cast their shadows before. Canelo has been involved in 2 fights with Austin Trout and Erislandy Lara that he was given decision wins where he probably should have lost. Will the Nevada judges give Canelo a win just for getting across the finish line? I would hope not, but we’ve seen Canelo win in the past in fights he arguably lost. Canelo might not be beatable by decision. •	Canelo brings in a lot of money to Las Vegas when he fights in the city. Canelo has fought 7 times during his 12-year pro career in Las Vegas, and 2 of those fights [Mayweather and Chavez Jr.] were big fights involving a lot of fans. For his part, Golovkin has NEVER fought in Vegas. Canelo has fought these opponents in Vegas: Amir Khan, Julio Cesar Chavez Jr., Erislandy Lara, Alfredo Angulo, Floyd Mayweather Jr., Josesito Lopez, and Shane Mosley. The judges for the Canelo-Golovkin fight still haven’t been revealed by the Nevada State Athletic Commission. –	Reduce the power on his punches to land. Canelo has good punch resistance, and he’s very difficult to hit cleanly with head shots because of the head and torso movement he uses in his fights. Canelo has added increasingly more head movement in his fights since his loss to Mayweather. He’s now very hard to hit with head shots, and he’s good at countering his opponents with uppercuts and hooks when they miss with one of their shots. The only way to hit Canelo is to time him, and hit him with a less powerful shot. Once a fighter is taking the power off of his punches just to land against Canelo, it puts them at a disadvantage, because they’re not going to be able to match his power. Golovkin cannot afford to be outworked by Canelo, and also can’t afford to take the power off of his shots just to land anything. Golovkin will probably have to swing for the fences and hope that he can still land something hard enough to knock Canelo out. –	Punch to Canelo’s body as much as possible to knock him out. This is a logical move for Golovkin to take to try and knockout Canelo. If Triple G can’t hit him with head shots, then throwing to the body is the best way to hurt Canelo. However, if Canelo knows that Golovkin is going to mainly throw body shots, he’s going to couch forward and drop his hands to cover up his midsection. Kell Brook did that against Golovkin in round 5 of their fight last September. Golovkin hurt Brook with a body shot in the 5th, causing him to drop his guard and stop throwing punches. Golovkin then went from throwing body shots to targeting Brook’s head. Brook’s corner Dominic Ingle had no choice but to throw in the towel when he saw that his fighter was no longer throw punches. –	Throw power jabs to neutralize Canelo’s counter punching. This is likely the plan that Golovkin’s trainer Abel Sanchez has for him to beat Canelo. Golovkin has a long reach advantage and the best jab in the entire middleweight division. We saw Golovkin neutralize David Lemieux and Danny Jacobs’ offensive output with his power jab in those 2 fights to beat them. Those guys are taller and have longer reaches than Canelo. Golovkin can take away Canelo’s counter punching ability as well as his uppercut if he throws jabs at him all night long. Jabbing is how you beat a counter puncher and a fighter that throws uppercuts. Canelo doesn’t have the reach or the mobility to counter a jab. Fighters with a long reach and mobility can shut down a fighter with a good jab, but Canelo doesn’t have the arm length, flexibility or quick enough feet to stop Golovkin from jabbing him all night long. 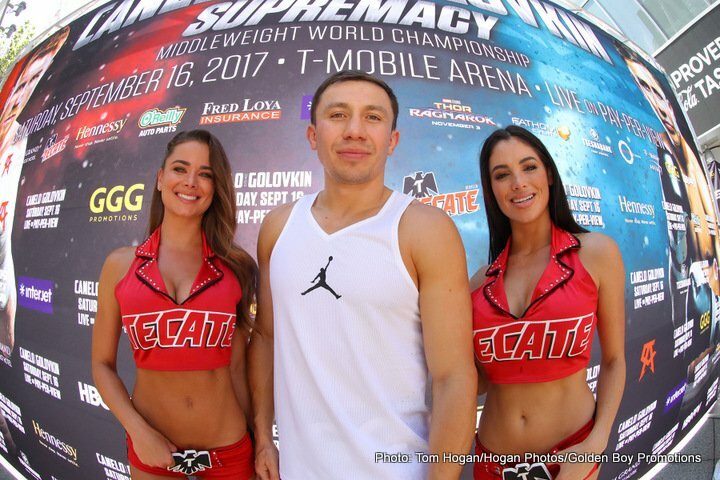 Boxing » Gennady Golovkin » Canelo v Golovkin: Can GGG win a decision in Las Vegas?